The NCAA tournament is a great platform for college basketball’s top players to present their skills not just to the viewing public, but to NBA scouts as well. The talent in college basketball is undeniable, and some of the better prospects still have time to show they are capable of performing on the biggest of stages. However, these aren’t the only skilled upstarts looking to become the next generation of NBA stars. There are a lot of outstanding players who are dominating in international leagues and they are poised to strut their stuff in the states. With that being said, here are five NBA prospects you’ve never seen play. Iliamane Diop is an intriguing prospect because of his incredible upside. At 6-foot-11, 225 pounds, Diop will need to fill out his slight frame and get stronger if he hopes to have success in the NBA, but those are minor fixes compared to what he brings to the table as a player. He is extremely long and has a great feel for the game. On the defensive end, Diop uses his length to his advantage and his 7-foot-4 wingspan makes him an extremely effective shot blocker. He can run the floor well and has a soft touch at the basket. Any team that considers taking Diop will need to understand that he is still a work in progress. But the raw talent he possesses makes him certainly worth the risk. Playing on loan for Manressa in the Liga ACB, Marc Garcia is a natural scorer. His knack for making shots was on full display during the last U18 European Championships when the 6-foot-6 shooting guard put up 17.1 points per contest. He has a sweet stroke with the ability to score off the dribble or from a spot-up position. Garcia can put the ball on the floor with both hands and has good control over his body. NBA scouts will love how creative he is with the ball. Not only can Garcia score from all over the court, but he also gets to the free throw line at a solid rate, where he shoots at above 80%. If he manages to get stronger, then he could be a great contributor at the NBA level. While he has yet to decide on the 2015 NBA Draft, that hasn’t stopped the hype from building for FC Barcelona’s Mario Hezonja. At 6-foot-8, 200 pounds, Hezonja is big, athletic, and a lights-out shooter. He is extremely strong in transition, and has no problem flushing a dunk with authority. He also doesn’t lack for confidence. 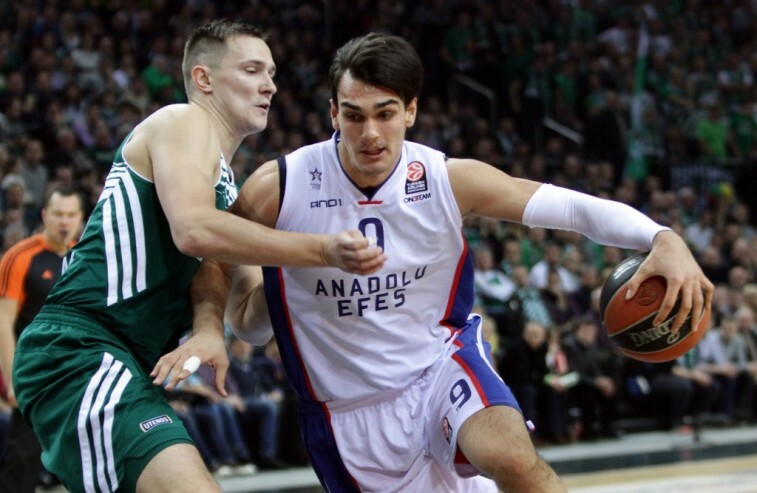 As Hezonja told Basketball Insider‘s David Pick, “If I was in college I’d probably be the No. 1 pick. I had an offer from Kentucky. I’m European and I need to work harder to break into the U.S. market.” He has all the tools to thrive in the NBA, but he needs to become more focused. If Hezonja improves defensively and learns to work within a team concept, then the sky is the limit. There is a lot to like about Sevilla’s Kristaps Porzingis. According to Yahoo Sports, “He is a top-three prospect. He’s a Dirk Nowitzki-type but more athletic. He runs the floor, plays above the rim and is a face-up guy. He has a shot at being the No. 1 pick and is definitely in the top three.” Porzingis is tall, long, and smooth. But he is more than just an interior finisher. The 7-footer can also stretch the floor, and has a great touch from the outside. Porzingis has beautiful form and impressive range. His release is quick and he can make shots off screens or from a set position. This combination of skills makes Porzingis an appealing player in the eyes of NBA executives. Emmanuel Mudiay had a lot to prove when he chose to sign a one-year, $1.2 million contract with Guangdong of the China Basketball Association rather than play in college at SMU. But instead of buckling under the pressure, the 6-foot-5 point guard thrived in his limited time overseas. Mudiay showcased his physicality, impressive skills with the ball, and undeniable athleticism. He has great court awareness and a high basketball IQ. Mudiay can run the fast break, find the open man, and finish at the rim through contact. He is certain to be one of the top picks in the 2015 NBA Draft and has the potential to be an elite guard at the next level. All statistics are courtesy of DraftExpress.